"'The Iron Throne,' the first of five books set in the Birthright gaming world, is a book that requires patience on the part of the reader. 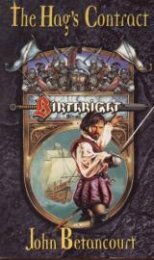 The book begins in an intriguing manner, mainly the abduction of a prominent character and the beginnings of a civil war. The long running civil war is the central theme in this novel. A select few in the war torn empire all try to achieve the title of emperor upon the death of the current, aging emperor. The one direct descendent is missing and another takes over the role as emperor. Once the descendent is found alive, another round of the civil war begins. The result has a lasting effect on the empire. The background of the nation is overly detailed and not absolutely essential to the central story. Once the civil war begins, the book accelerates at a rapid pace. After the civil war, a former human named Raesene but now transformed monster named the Gorgon, has his own plans for the empire. Once the Gorgon starts employing members of the empire to achieve his desires, another war soon ensues. The Gorgon also causes some internal strife among major players within the empire. The ending, while a bit surprising, is presented well and does leave the door open for a sequel. 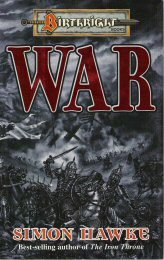 The sequel, 'War', was the last of the Birthright books published by TSR. 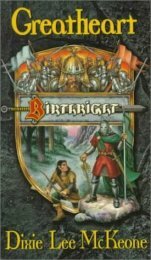 All of the Birthright books are out of print. If you are a fan of historical, civil war fantasy and are a patient reader, 'The Iron Throne' would be a worthwhile read." ...from Amazon reviewer "gothamguardian"
"In the lands of Sielwode, the elves face a fierce confrontation not only with the encroaching humans, who are threatening their sacred groves, but also with the undead and the other monsters of the Shadow World." "Ulrich Graben, a Brecht pirate king, led a small outlaw fleet from the Zweilunds to the icy, hospitable lands at the mouth of the Krakennauricht. There he ruthlessly carved out a kingdom for himself in the shadow of Drachenward. 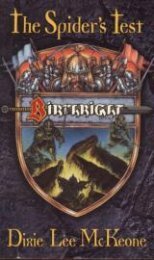 It is rumored that Ulrich made some unholy pact with the infamous Hag for the powers to free the land from the savage orog and goblin tribes, and lay his own claim to the domain . . . but all contracts have a price." "When Richard Endier fights to establish new lands for a growing community of followers, he knows he will one day face the mighty Tal-Qazar. Once a goblin soldier, now a dreaded awnshegh, the Spider King guards his forest kingdom with cruel madness. 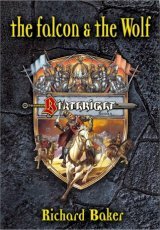 With his people at his side, Richard battles the Spider King's army of goblins and giant spiders, knowing that one day the Spider himself will join the fray. Richard Endier has no choice. For the sake of his people, he must meet the Spider on the creature's own ground in a batte of wit and deception. The future of a new kingdom hangs in the balance." "Michael Roele died trying to save his empire. Now it is fraught with anarchy and intrigue as heirs, pretenders, and usurpers vie for power, threatening to tear the realm asunder. A new savior is needed -- one who will ascend to the Iron Throne and lead the empire out of chaos. But until that time, the empire will be ravaged by war." "When his family is killed in a treacherous attack, Gaelin Mhoried becomes the heir to his father’s land. Armed only with his sword and his wits, he struggles to master the power of his ancient bloodline and free his homeland from the oppressor’s armies. Includes background appendix." Never printed. Wizards of the Coast had it available for a while as a free pdf, but have long since pulled the link down.